GERMAN CHANCELLOR ANGELA Merkel has condemned violent far-right protests in the country in recent days, saying “hate in the streets” has no place in Germany. After the fatal stabbing of a German man (35), allegedly by a Syrian and an Iraqi, thousands of protesters marched in the eastern city of Chemnitz for two straight days, some chasing down people they believed were immigrants. At least 20 people were injured yesterday as pyrotechnics and other objects were hurled by both far-right demonstrators as well as anti-fascist counter-protesters in the city. We have video recordings of (people) hunting down others, of unruly assemblies, and hate in the streets, and that has nothing to do with our constitutional state. But there was little sign of the marches spreading further today, with a right-wing demonstration in the state capital Dresden attracting just 50 people, according to regional newspaper Saechsische Zeitung. 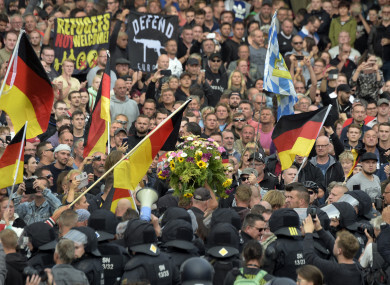 Anetta Kahane of the anti-racism Amadeu Antonio Foundation told news channel NTV that, while people have the right to demonstrate, “what happened in Chemnitz went beyond that – it was incitement to hatred and the propagation of pogrom sentiment”. The circumstances that led to the death of the German man remain unclear, but the far-right quickly mobilised on Sunday as word spread online that the key suspects were foreigners. Frankfurter Allgemeine Zeitung noted that “where such hunting down of foreigners is possible, the rule of law has abdicated”, while Die Welt daily warned that “the rule of law and police now face a test”. Email “Merkel says 'hate in the streets' has no place in Germany following violent far-right rally”. Feedback on “Merkel says 'hate in the streets' has no place in Germany following violent far-right rally”.